International Nouveau Flamenco ensemble Luna Blanca is now leading the way to worldwide prominence by their festive new release entitled El Dorado. The vibrant forerunner to Luna Blanca’s new album was their celebrated flagship album Provence, which in retrospect is, one of the best Nouveau Flamenco releases from coast to coast. Luna Blanca has ascended to the highest summit as a group, nearing the verge of perfection with their elite signature song melodies that have carried them to international acclaim on every continent. This time around Luna Blanca intensifies their musical fortitude by moving Nouveau Flamenco music to new elevations, where no artists before them have reached. The highest latitude of earlier success may be due in part to a precise focus on producing energetic song melodies. Created with true passion, it’s only natural Luna Blanca’s vibrant flamenco music appeals to a broad multicultural audience. 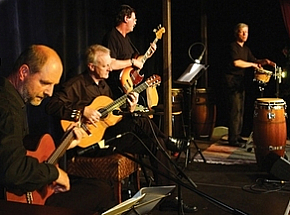 The Germany based band Luna Blanca, who regularly perform live concerts, have reached international prestige over the past decade and duly earned their reputation as one of the most popular Nouveau Flamenco music ensembles worldwide. The cosmopolitan sound qualities heard in El Dorado express the diverse ethnicity of Nouveau Flamenco with classic sophistication and grace, yet the sunny casual atmosphere is the greatest defining characteristic of Luna Blanca. El Dorado is a remarkable new flamenco album by the straightforward presentation of Luna Blanca, and the inherent qualities of artisanship that first began their rise to popularity. It is clear to me that Luna Blanca has their fingers placed on the pulse of today’s popular Nouveau Flamenco music style. Masterful in this new flamenco music release, founding band member and guitarist Richard Hecks, and co-composing pianist Helmut Graebe, select world-class musicians like brilliant rhythm guitarist Bino Dola, and Clemens Paskert, a dazzling performer on bass guitar, percussion and second part keyboards. Luna Blanca clearly has a new reason to celebrate in 2012 with the release of their new El Dorado album. When taking into consideration the Top 10 radio chart success, glowing reviews and accolades given to Provence the past year, it’s as if their time for festive celebration is never ending with each passing year. 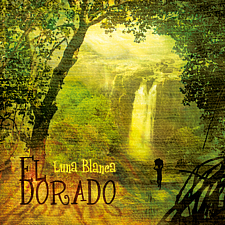 Luna Blanca has produced an exhilarating new wave of excitement with this new project in 2012 which nearly guarantees El Dorado will be one of the best and most talked about Nouveau Flamenco music albums during the year 2012 and beyond. I can picture another year of honors and tributes, again with all glasses raised in a goodwill toast to Luna Blanca. Cheers! Visit LunaBlancaMusic.com. Find the soon to be released El Dorado at the Luna Blanca music store, or at Amazon.com. Read about their Provence album on my page for Luna Blanca. Photos are courtesy lunablancamusic.com.